Two residents from Elizabeth Court care home in Caterham have offered romantic advice to young couples celebrating Valentine’s Day. 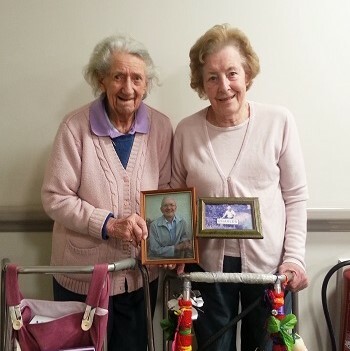 Residents Joan Borroff, 98, and Eileen Bellingham, 91, are new to being ‘agony aunts’ but hope their experience of married life will help young couples have a happy and long relationship. The pair will join the other residents at Anchor’s Elizabeth Court in Grenadier Place for a Valentine’s tea dance on Saturday (16 February). Joan, who married Jack in Wood Green, North London, in 1951, said the secret to their marriage was the fact they didn’t have a car! Scottish-born Joan, who lived with Jack in Whyteleafe for more than 50 years, said: “As we didn’t have a car, we had to walk everywhere so we spent a lot of time together. My advice to young couples would be a bit of give and take on both sides. Great grandmother Eileen, who was married to Charles for 55 years, said the highlight to their marriage was their three children. Elizabeth Court Manager Sue Guyon said the Valentine’s party was part of a packed programme of activities at the care home. She said: “This is such an exciting event. There will be lots of fun, colour and wonderful food. Older people have a life time of experience when it comes to love so it’s great they can offer younger couples advice. “The tea dance is part of Elizabeth Court’s ongoing programme of interesting activities which aim to stimulate the residents physically and mentally.